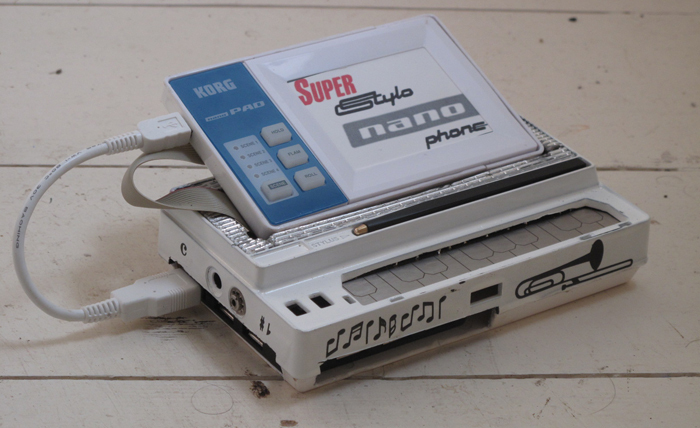 I wasn’t intending to get into MIDI instruments at the time I started on this project, and construction of the Superstylonanophone came about by accident when I acquired an apparently non-working Korg Nanopad. 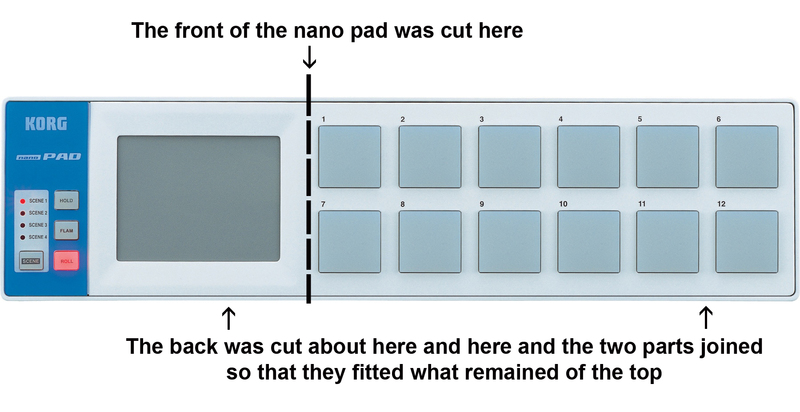 Essentially, what it is is a cut-down Nanopad attached to a Stylophone, so that the middle 12 keys of the stylophone operate what would, in the Nanopad, have been the 12 pads. The touch sensitivity of the original pads seems to have all but gone, which is a big loss – but the pads didn’t work at all on the device I acquired, so the present arrangement is an improvement on that. I have since learned that stuck pads is a common fault in Nanopads, and there is currently an instructional video on YouTube at www.youtube.com/watch?v=BuomrJNd0cM, uploaded by treilaux,* telling you how to fix them. If you have a Nanopad with stuck pads, you could do that instead of what I did; even if you don’t, you can see from that film how I took the Nanopad apart and detached the pad section from the electronics section. I continued by sawing off the large right-hand section of the Nanopad with the pads in it, and was left with just the circuit board, ‘Scene’, ‘Hold’, ‘Flam’ and ‘Roll’ buttons and the track pad. I trimmed down the back as well, to fit the remaining piece of Nanopad front panel. Everything was removed from inside the Stylophone (it was no longer working), except the PCB with the keyboard on it. The difficult bit was connecting the Nanopad PCB to the Stylophone PCB. This was not difficult in principle, but only in practice. The Nanopad pads were operated by a plastic film connected to the PCB via a 14 way ZIF socket. 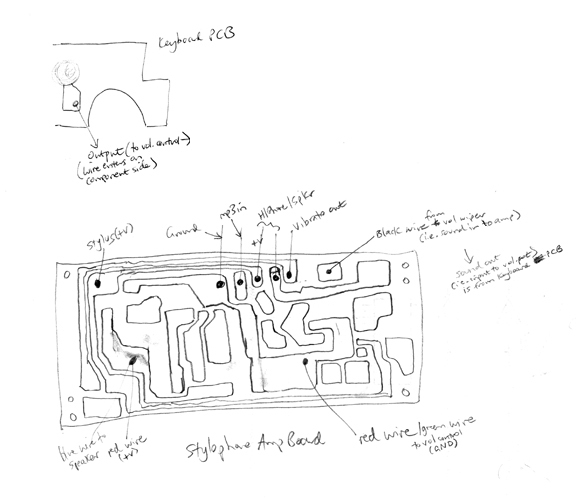 The connections on the PCB were too small for me to get at – just 1mm apart – so I was hoping to find a replacement 14 way jumper cable that would be long enough to go from the ZIF socket, out of the new Nanopad enclosure into the body of the Stylophone. I couldn’t find one: it wasn’t a proper ribbon cable, but another thin plastic thing, and in the end I had to get a short one and solder a proper ribbon cable to another ZIF socket at the other end of it. I managed to find a type with alternate pins pointing in opposite directions, giving me 2mm space between each one. The other end of the ribbon cable attached to the backs of the 12 middle keys on the Stylophone PCB. I chose C – B because these are the defaults for the Nanopad’s Scenes 2 – 4, which resemble a conventional keyboard. You can change this with the Korg Kontrol Editor program, but there seemed no point. The 14 lines from the Nanopad PCB to its pads were one connection for each pad, plus 2 control lines, one for the top row of pads and one for the bottom row. I was gambling that these two control lines were, in fact the same, as the Stylophone’s stylus has only one wire going to it and I obviously wanted to be able to play all 12 notes. Fortunately, I was right, so in the end only 13 connections were needed. However, since the Nanopad is polyphonic, it seemed a bit of a waste not to take advantage of this, so I added a socket on the side for a second stylus. This is connected to the same spot on the circuit board as the integral stylus. 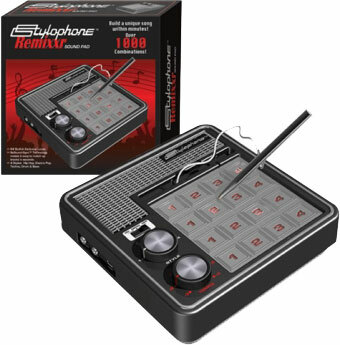 After using the Stylonanophone for a short while, I realised that this is a great asset, especially for playing drums and percussion, even if only one note at a time is sounded. Because foot controls would be more natural for some applications (e.g. bass drum and hi-hat, or bass pedals) I added an external socket for other input devices to connect to, giving access to all 12 notes. I’ll be writing in more detail elsewhere about the switching systems I’ve devised, and later on in the blog about any of the input devices I’ve been working on, as and when they get finished. The Nanopad doesn’t have MIDI in and out connections: instead, it has a built-in MIDI interface, and requires only a USB cable. To allow for the possibility of future expansion (for example, I also have a Nanokeys I plan to work on), I decided to add a USB hub. I found a flat square one that fitted into the base, and didn’t interfere with the vast amount of wiring inside the Stylophone body. I superglued this in place. The Superstylonanophone connects to this hub with a very short mini-USB to USB A cable, and the hub connects to the computer with a longer one. The hub has proved very useful when I’ve needed to plug in more USB devices. 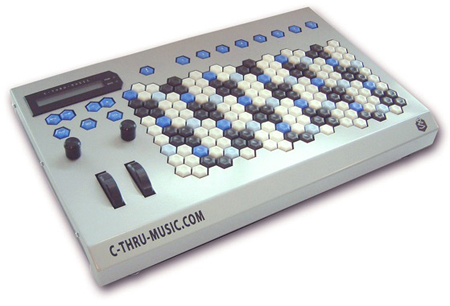 There are no sound files to go with this instrument, as it’s a MIDI controller, and can be used with any real or virtual MIDI instrument. See this post for details of the foot controller I made to go with the Superstylonanophone. [Edit: the BigBoy, alas, is no more! 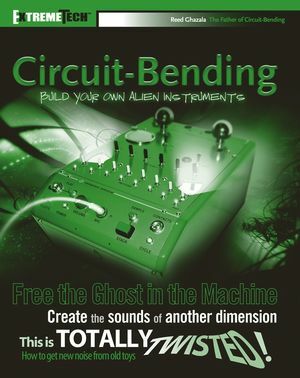 I irreparably damaged the circuit . 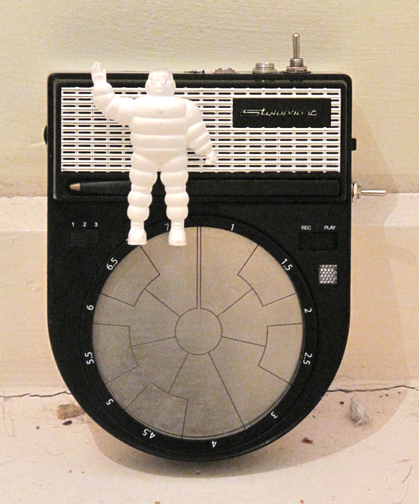 . . but now it lives on in the BigBoy Beatbox, which is described here]. 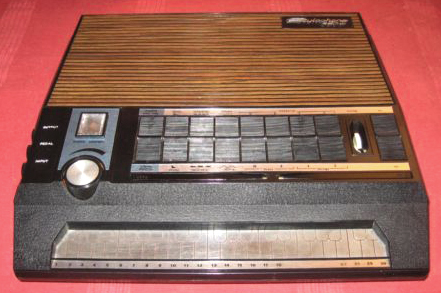 The creation of the Big Boy came about as the result of the blindingly simple, though ultimately pointless idea of transplanting the workings of a Stylophone into the body of a Stylophone Beatbox. I had a number of broken donor Beatboxes, and proceeded to dismantle one of these. 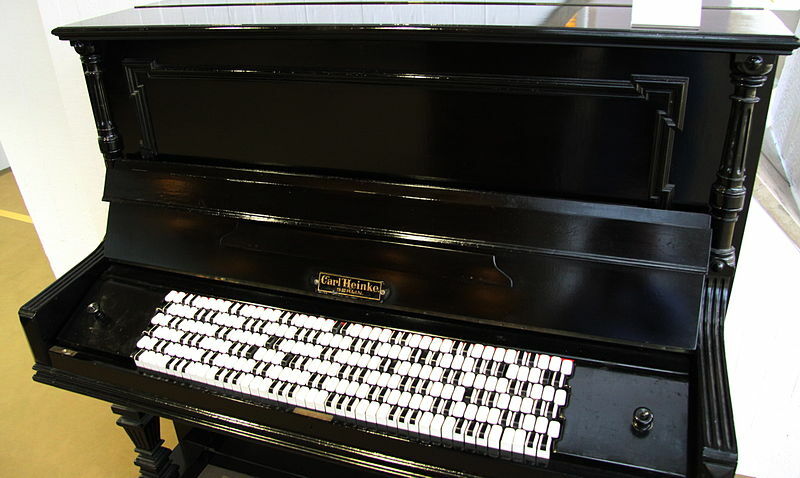 There are 12 ‘keys’ on the circular board, laid out in a similar way to piano keys, or the keys of a Stylophone, so one octave was available. I decided there should be three octaves, so had two challenges: one, to connect the Beatbox keyboard to the Stylophone keyboard; two, to add switches to change octaves. Connecting the two boards together proved fairly simple. FirstIy I had to saw off the end of the Stylophone board to make it fit into the Beatbox case, and although this made it impossible to use the higher notes, there were still at least 12 left. So I used the lowest 12 keys, soldering one end of a wire to the middle of each key on the Stylophone board, and the other end of the wire to the connection on the edge of the Beatbox board for the appropriate key. It was easy to see which key on the Beatbox board led to which connection on the edge. There are also two built-in switches on the main Beatbox board, operated by depressing either side of a plastic ring around the keys. I also made connections to these, for later use. The existing on/off switch was used, with its associated LED, and the space taken by the 3 way slide switch used for selecting the drum, bass or vocal beatbox modes was used for the Stylophone 3 way tone switch. The Beatbox stylus was attached to the place on the Stylophone output board where the Stylophone stylus had been attached. I carefully removed the Stylophone tuning pot and used it to replace the Beatbox tuning pot on the small board which is attached to the inside of the base of the Beatbox. One end terminal of the pot was attached by a wire to the place it was originally attached to on the Stylophone board; the centre terminal was connected to +V at the same place on the Stylophone output board as the stylus, via a series of preset potentiometers, as described below. The preset potentiometers were designed to produce the three octaves. If there had been room for a 3 way rotary switch in the body of the Beatbox, this would have been simple. But there wasn’t. There was room for a three way miniature toggle switch of the ON-OFF-ON type, so I decided to use one of these. With a simple 3 way switch, it would just have required three presets, each adjusted to produce the same note in different octaves; but with the 3 way toggle it required the middle terminal to be permanently connected, and the other two pins – representing the switch in the ‘up’ or ‘down’ position – to be in parallel with the middle terminal resistor. This proved quite complicated, and many adjustments were required before the 3 octaves became available. 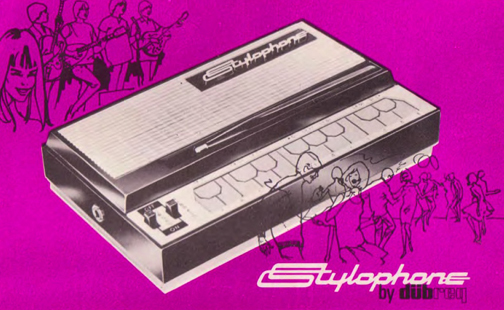 The Stylophone functions in such a way that the lower the resistance, the higher the pitch. As the rule about two resistors in parallel means that their combined resistance is always lower then the resistance of the lowest of the two, the middle position had to be the lowest octave, and the ‘up’ and ‘down’ positions had to be two octaves higher and one octave higher, respectively. The integral switches on the board, operated by the plastic ring, duplicated the function of the toggle switch, allowing for momentary octave changes when either the left or right switch was depressed – this only really worked when the toggle switch was in the middle, ‘off’, position, but that was the most practical setting for most uses, I found. An extra 10k resistor had to be placed in series with the stylus connection, to ensure that the correct pitch could be achieved with the tuning pot roughly in the centre of its travel. If you’re interested in using computer software for making musical instruments or sound manipulation, there are several programs you can use, but my favourite is Pure Data. 4. There’s a lot of help available, and a lot of people using it who are happy to share their experiences, and applications (or ‘patches’) they’ve written with it. Another feature of the program, which I have not used myself, but which you might like, is its ability to handle graphics and video, and integrate these with sound. This example shows MIDI information and audio information being used together as Pure Data can deal with them both. 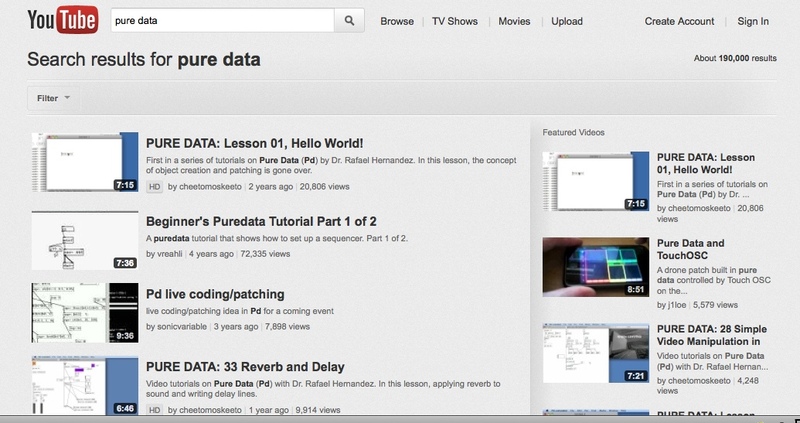 From the Pure Data website, you can access manuals and tutorials, and a very helpful series of video lessons. These are also on YouTube: just search under ‘Pure Data’. The most practical version to use is ‘Pd-extended’, which you can download from here: http://puredata.info/community/projects/software/pd-extended. I use a Mac, but the program is also available for Windows and Linux. [Edit: I believe that since I wrote the above, Pd-extended is no longer being developed, so you may consider using the unextended Pd ‘vanilla’. I assume there is a straightforward way of adding the kind of features which Pd-ectended contains]. 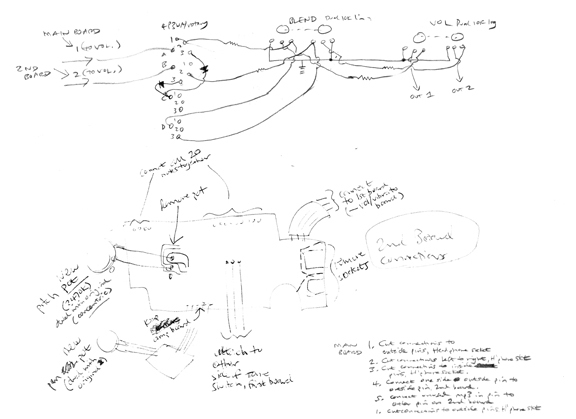 Another program for general use is MAX/MSP, which is very similar to Pure Data – in fact, it was invented by the same person, Miller Puckette. The version you would use to create programs is not free, but the version you would use to run other people’s programming – ‘Max Runtime’ – is free. It’s described at and can be downloaded from the Cycling 74 website at http://cycling74.com/products/max/. There are Mac and Windows versions there. 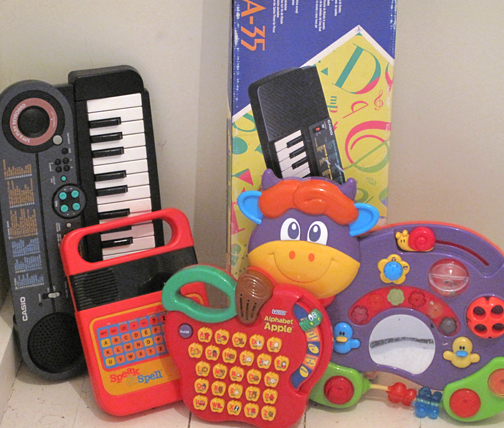 Other programs I’ve used in this series of projects are to do with different methods of note input – in other words, programs which can interpret input from a QWERTY keyboard, a mouse, joystick, gamepad, etc., and allow you to use it for musical purposes. These devices are collectively known as HIDs or Human Interface Devices, and programs such as Pure Data and MAX/MSP can readily be set up so these HIDs can be used as musical instrument controllers, just like a MIDI keyboard. MIDI Integrator (a MAX/MSP application), which is an easy and efficient way to set your computer up to accept input from keyboard, mouse and so on and use them as MIDI controllers. The program is described at www.altkeyboards.com/integrator and can be downloaded for free from there. 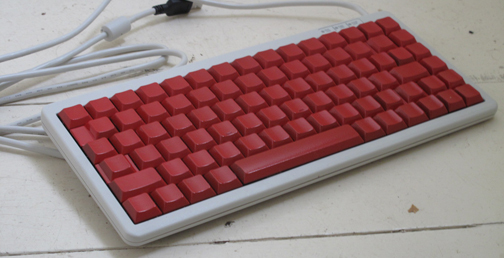 In fact, that website, ‘altKeyboards’ is a mine of information about alternative keyboard layouts, which I intend to write about separately at some point. 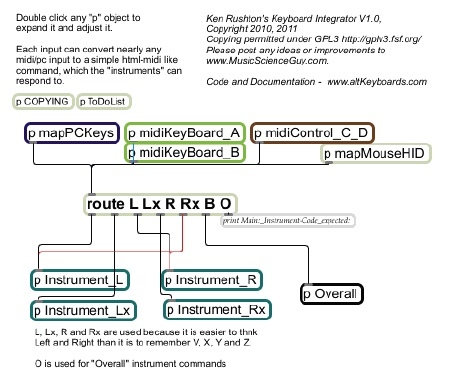 It’s well worth looking at this page www.altkeyboards.com/instruments/isomorphic-keyboards to see what inspired author Ken Rushton (‘MusicScienceGuy’) to create MIDI Integrator. 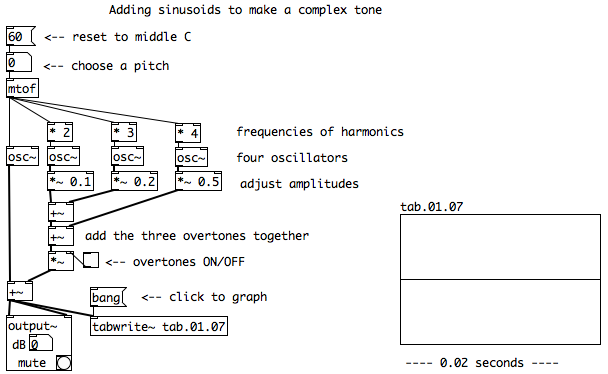 Another MAX/MSP-based application is Alexander Refsum Jensenius’s ‘MultiControl’, which is able to recognize input from HID and convert the signals to MIDI output. You can read about it and download it from here: www.arj.no/2008/02/25/multicontrol-v04/. 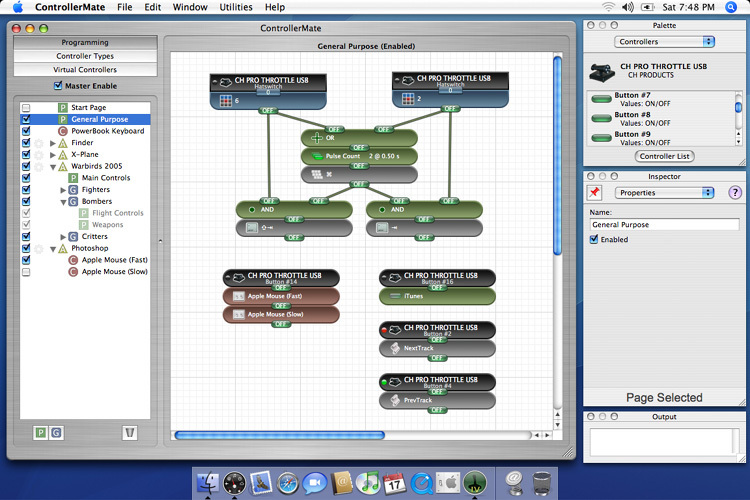 And finally, a program which is very good, but not free and available for Mac OS only, is ControllerMate. ControllerMate is a very flexible and detailed program for customising input from of all kinds of HIDs. It allows you to assign particular functions to all the buttons and controls on a device such as a keyboard, mouse, joystick etc., and to set up different named configurations – including multiple configurations for the same device – to make it quick and easy to use them for different purposes at different times. ControllerMate is described at www.orderedbytes.com/controllermate/, and can be purchased from there. These are the programs I’ve found most useful so far. I’ll describe them in more detail when I report on the projects I used them for. 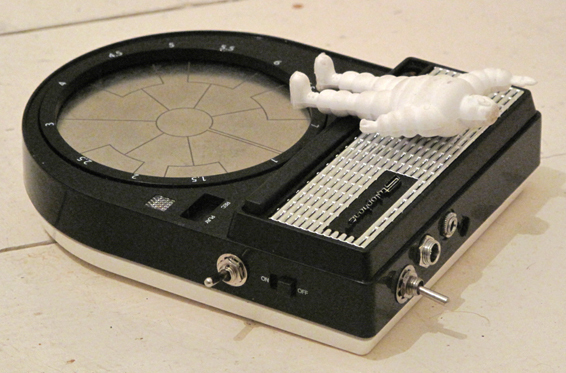 I was apprehensive about my third project, my final Stylophone mod for the time being, since it involved major surgery to two individual Stylophones, and I wasn’t really sure at the outset whether it would work. In the end, in an unpredictable way of its own, it did! 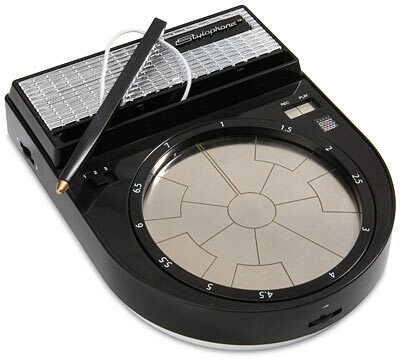 The concept was simple, to generate two notes at the same time, using two Stylophone circuit boards operated by one stylus. 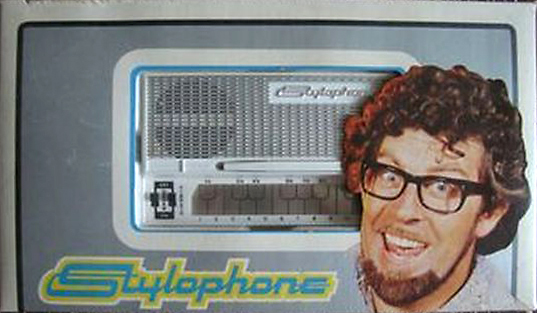 The ability to tune the fundamental note had to be retained, as well as means of selecting any harmony note – and, of course, it had to be possible to play the Stylophone as originally intended. This photograph shows the main pitch control of the Gemini, the dual concentric potentiometer at the back left, as well as the fine tune, volume and blend controls on the back. It also shows its decoration with signs of the zodiac stickers – I think the sign of Cancer (not visible) is the wrong way round, but this is not my fault, it was like that when I bought them. The first extra control to be added would be a 3 way rotary switch, to select ‘Normal’, ‘Harmony’ and ‘Modulated’ outputs. This is just visible on the right hand side of the picture above. 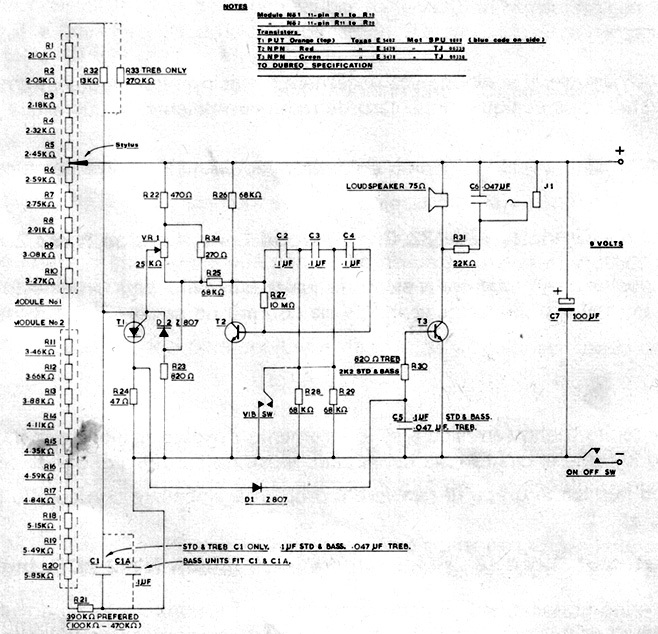 ‘Normal’ would switch only one of the boards in circuit, with a mono output available to the internal speaker or to the headphone output; ‘Harmony’ would switch both boards in circuit, with one board available to the internal speaker, but both boards available to left and right sides respectively of the headphone output; in ‘Modulated’ mode, the outputs of the two boards were connected by diodes to allow the tones to interact with one another. A dual 10k lin pot was used as a ‘Blend’ control, ranging from Board One (Oscillator 1) only to the left, and Board Two (Oscillator 2) only to the right, with varying mixes in between of the two tones produced. A dual 10k log pot controlled the overall volume. 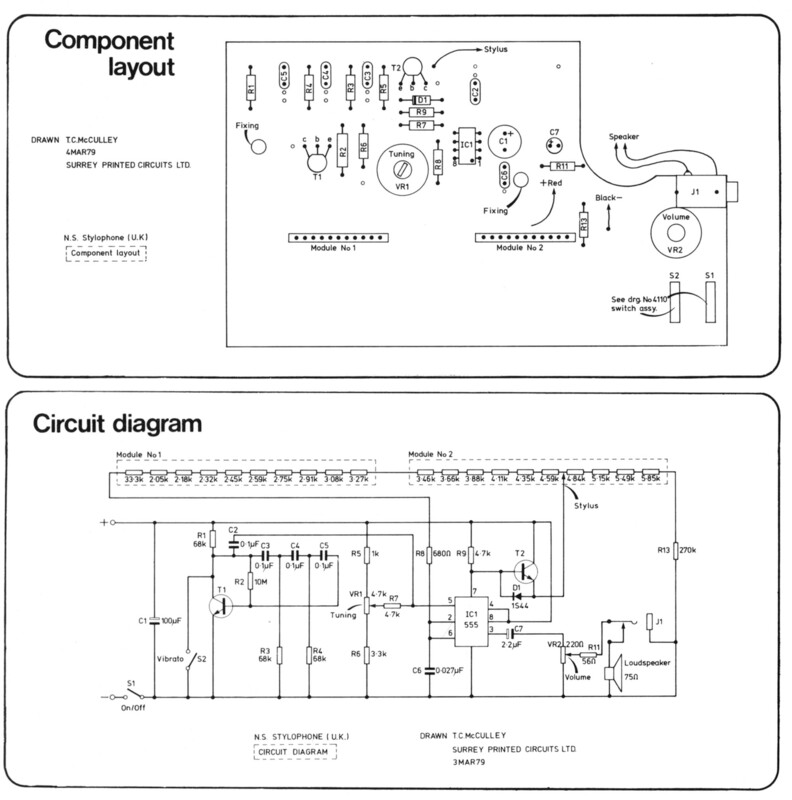 These were located in the circuit in place of the existing volume controls and both original volume pots and associated circuit boards were removed. 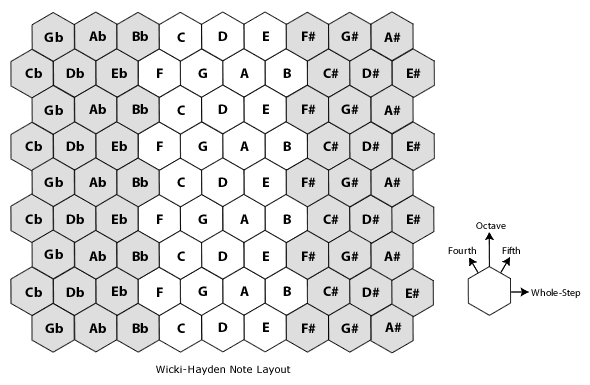 Pitch was to be controlled by a dual 500k concentric pot, the inner control for correct tuning of the fundamental pitch, the outer control for the harmony note, the interval being set by ear. As this pot would cover a wide range, and the fundamental note would be difficult to set precisely, I decided to add a 10k lin pot, normally in centre position, in series with the inner pot, as a ‘Fine Tune’ control. The first problem was to test if removing one stylus and connecting the ‘keys’ on one board to the corresponding keys on the other board would successfully enable one stylus on one keyboard to create two distinct notes at the same time. Connecting the keys was easy enough, as each one has a small point – presumably included for testing purposes at the factory – to which wires could be connected. To my relief, this procedure worked, two notes were produced simultaneously, and the interval set remained steady along the length of the keyboard. 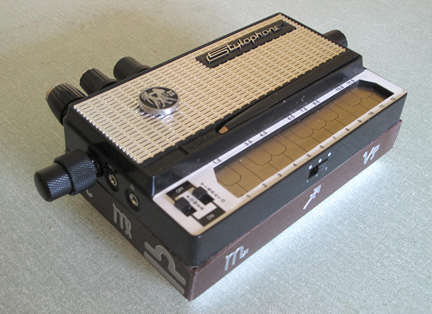 The Stylophone’s original 3-way tone switch, as I had discovered on my first modification project, is a two-pole type, with only one pole used; so it was easy to connect the three wires from the two boards to other side of the same switch, to ensure the same tone was used on both boards. I hoped the same would be possible with the vibrato, and connected the main boards together at the 3 inputs to the small board containing the power and vibrato switches. This worked, too, and enabled one power on/off and one vibrato on/off switch to be used for both main boards. It was the ‘mp3’ input/headphone output that caused difficulty, and I didn’t fully resolve this problem, I just got round it in a not entirely satisfactory way. I had hoped that the outputs of the two amplifier boards would simply appear separate and equal at the headphone socket, and that a stereo input would appear as a stereo output. (A stereo input is normally reproduced in mono through the internal speaker and the headphone output, as an unmodified Stylophone has only one mono amplifier in it). I disconnected one of the mp3 inputs and one of the headphone outputs from Board One and replaced them with an input and an output from Board Two, in order to make this happen, but it was clear that one of the channels was leaking into the other one somewhere and the output was still mono, even though using two amplifier boards. I had removed the 3.5mm sockets from Board Two, in order to fit this in the original case on top of Board One – maybe this had some effect on the stereo image, I don’t know. But I eventually created a slightly stereo output by putting a 1k preset into the output of one channel, so Oscillator 1 was slightly to the left in the headphones, and Oscillator 2 slightly to the right. This was the effect I was after in the first place, it just wasn’t the way I anticipated achieving it. However, this was close enough to what I set out to create, so I considered the job done. As it turned out, the pitches of the two oscillators couldn’t be set independently – raising the pitch of one would automatically lower the pitch of the other, and vice versa! Not only that, but as the 500k pots were logarithmic the pitches would vary at different rates. This apparent disadvantage, I decided, would be turned to an advantage – and would, in fact, be the whole point of ‘The Gemini’: the careful adjustment of the three pots to obtain a suitable pair of notes would become its principal performance feature. The stylus, of course, was still fully functional, so as soon as a suitable interval was stumbled upon, this was playable up and down the keyboard. Fitting everything back into the case was not easy, and involved quite a bit of rewiring to reduce the tangle of leads inside. I had hoped to be able to fit everything in the original Stylophone case, but it soon became apparent that this wouldn’t be possible, so I aimed to deepen the case, as I had with ‘The Hedgehog’ – although not so drastically, as there would be fewer extra controls to add. In the end doubling the depth proved adequate to contain the extra boards and wiring without unduly squashing them. The extra piece of bodywork added to the case proved an ideal base for the zodiac motif stickers I added. In use, the basic pitch seemed somewhat lower than originally intended, but it turns out that ‘The Gemini’ is perfect for bass sounds, and some excellent tones are obtained, especially in ‘Modulation’ mode.